Gladstone Senior Investigator Katerina Akassoglou, PhD, was awarded a prestigious multi-year, multi-million dollar grant from the National Institute of Neurological Disorders and Stroke (NINDS). The award is worth nearly six million dollars in direct costs, which will be administered over the next eight years. 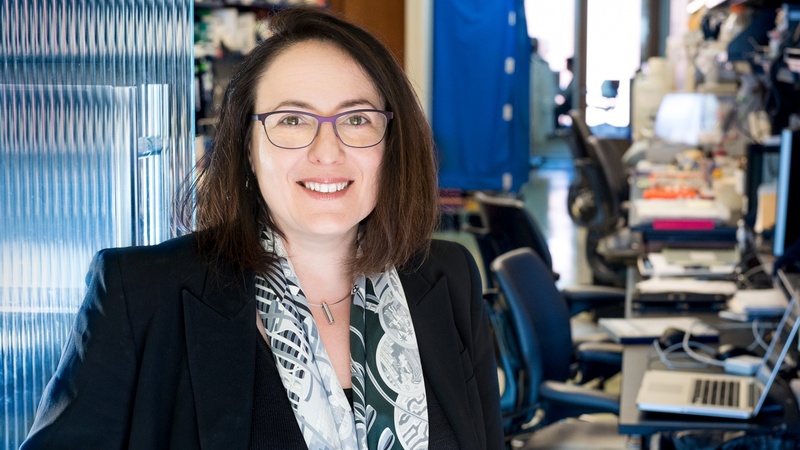 Akassoglou, who is also a professor in the department of neurology at the University of California, San Francisco, will use the grant to advance her research on the role of the brain’s vascular and immune systems in neurological diseases. “NINDS created this pilot program to improve the value of the research it funds by enabling proven investigators to pursue long-range, innovative research instead of continually writing and submitting grant applications,” said Walter Koroshetz, M.D., the NINDS director. The NINDS Research Program Award (R35) provides longer-term support and increased flexibility to exceptional scientists who have a consistent record of high-impact contributions to neuroscience. It promotes ambitious, creative research and offers investigators greater freedom to embark upon research that breaks new ground. Akassoglou’s research focuses on the intersection of the brain, immune, and vascular systems. Her lab pioneered the study of blood proteins in neurological diseases, showing that when these proteins leak into the brain, they damage brain cells and activate the brain’s immune system, triggering inflammation and neuron death. Akassoglou identified one blood protein in particular, fibrinogen, that is strongly implicated in multiple sclerosis. She thinks fibrinogen could be a therapeutic target for multiple sclerosis and many other neurological diseases. Her lab also discovered that a component of the membrane that envelops the cell nucleus plays a key role in regulating the activity of brain cells. “We are excited about the basic scientific discoveries and therapeutic developments this prestigious award will enable, and we are proud of the confidence it reflects in Katerina and our institution,” said Lennart Mucke, MD, who directs the Gladstone Institute of Neurological Disease.